Is She a German Shepherd Mix puppy? My husband, a police officer, recently rescued a stray puppy from subzero temperatures while on duty. He fell in love with her right away and, needless to say, she is now the newest member of our family. Being so close to Christmas, we named her "Rudy." She is undoubtedly a GSD, but we have no idea if she is a mix and, if so, with what other breed she is mixed. We have had a member of a GSD Rescue tell us she looks to be purebred. We will love her regardless, but are just curious what you and your viewers might think. Thank you and Merry Christmas!!! Congratulations on your newest addition, Rudy! And please give your husband a hug for me for rescuing this baby. What a great and heroic rescue. So, let's post your story and picture and see what the readers think. Either way, I know your new rescue will love you and provide you with years of companionship and love. Good luck with her and maybe in the future you can post some updated pictures of her too! Comments for German Shepherd Mix? 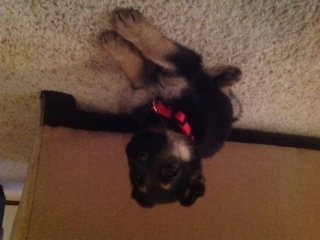 Congratulations on your newest member of the family, Rudy, she is Adorable and Beautiful pup! She looks full blooded, if not, she is a Lot of German Shepherd, her markings, her legs and her paws, her face and muzzle. Her ears now will be floppy up and down and down and up while she is teething and then wow, their up big and straight up when she is about 8 months or sooner. You can do a DNA test for the breed. She looks about 3 months old in the picture. I work for a Police Department too (civilian) and it's where I got my Mia, 12 wk old puppy how Lucky was I to get that call!!! She just turned 4 yrs old. German Shepherds are Amazing, so Protective rather male or female it doesn't matter it's in their blood. Take care of your Precious Rudy and she will take care of you! Read our story it's pretty amazing how I got her too, Our GSD puppy Mia's story and Mia our beautiful GSD. Congrats again!! !